Walk the Line actress Reese Witherspoon could be in line for a country music video award following her success at the Oscars earlier this month. Witherspoon and co-star Joaquin Phoenix have been nominated for "collaborative video of the year" at next month's Country Music Television (CMT) Awards. 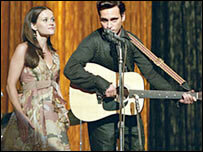 The nomination is for a scene in the Johnny Cash movie where the duo perform the song Jackson. Faith Hill, Tim McGraw and Keith Urban are among this year's other nominees. Country Music Television, part of the MTV network, has been presenting awards since 2002. Hosted by comedian Jeff Foxworthy, this year's ceremony will be held at the Curb Event Center at Nashville's Belmont University. It will feature performances by Gretchen Wilson, Brooks & Dunn and Kenny Chesney, actress Renee Zellweger's ex-husband. The awards, on 10 April, will precede this year's Country Music Awards (CMA), which take place in Las Vegas on 23 May. US singer Brad Paisley - who is up for three prizes at the CMT Awards - leads the CMA race with six nominations.